Since taking my first class as an undergraduate student, I have been drawn to anthropology because it constantly pushes me to challenge my assumptions about the world. After receiving a BA in Anthropology from DePaul University, I had the opportunity to apply what I learned working for the National Park Service and other partner organizations. I was able to see first-hand how heritage sites have the ability to bring people together through the stories that these places preserve and tell. Most recently, I continued my education in anthropology, graduating with a Master's degree from the University of Denver. What excites me most about applying anthropology to my work in the world of heritage is its ability to shed light on the ways that these places, which are records of the past, are still very much alive. They provide a window into where we came, shaping how we understand ourselves in the world today and who we want to be in the future. Q: What are some of the projects you have worked on in the past? Much of my past experience has been in the preservation and interpretation of Japanese American World War II incarceration history. 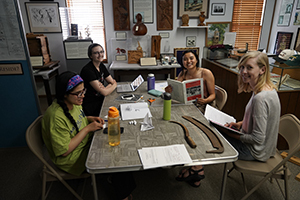 While working at Manzanar National Historic Site, a former site of confinement, I was involved in developing exhibits and supporting their oral history program. As a graduate student at the University of Denver, I was able to continue my work with this history as part of the DU Amache Research Project, participating in museum and archaeological work at another former site of confinement. The most rewarding part of working at these sites has been connecting with people who experienced the incarceration and their family members. I am grateful for those who have shared their experiences with me and broader audiences. Their stories continue to have a personal impact on me and the thousands of people who visit these sites. Q: What drew you to work with CyArk? I am excited to be at CyArk because of their innovative work in making cultural heritage accessible to the world today and in the future. The places that CyArk digitally documents and archives illuminate both the diversity and shared aspects of how people have lived out their lives historically and today. I am happy to be part of an organization that is pushing the boundaries of what is possible in heritage preservation and supporting heritage managers around the world. CyArk’s initiative for making their work accessible through various mediums such as virtual reality and their raw data provide opportunities for people to have unique, immersive learning experiences and create their own meanings using the information. My experience working at heritage sites has shown me the power of these special places, and CyArk’s work creates new and accessible spaces for people to connect with these sites in new ways. Q: Is there any project you’re particularly excited to work on and be involved with? CyArk was recently awarded an NEH grant for developing a prototype VR experience that will guide learners through the layered history of Mesa Verde’s Balcony House cliff dwelling. Part of what makes Mesa Verde such a powerful place is how the site is not only connected to people’s stories who lived thousands of years ago, but also how it connects to diverse groups of people today. To guide the narrative of the VR experience, CyArk will be working with an American Indian advisory board and other stakeholder groups. I am excited to be involved in this project and continue my work facilitating connection to meaningful places with the communities who have the most at stake in how their stories are told. Whitney with scythe artifact found at the former site of Japanese American WWII incarceration, Amache.